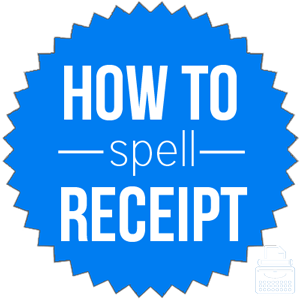 Spelling of Receipt: Receipt is spelled r-e-c-e-i-p-t. The rule, “-i before “-e” except after “-c” applies here. Definition of Receipt: Receipt is the act of receiving something or the fact that something has been received. A receipt is also a written acknowledgment of the receiving of money or the payment for goods or services. It also refers to the act of giving a receipt for the payment or purchase of something. Pronunciation of Receipt: Receipt is pronounced ruh-seet. The “-p” is silent. Receipt rhymes with deceit and conceit. What does receipt mean? Receipt usually functions as a noun referring to a written, electronic, or printed acknowledgment of the payment for goods or services, or the fact that something or an amount of money has been received. Keep your receipt in case you need to return anything you purchased today. You must complete the form within 15 days of receipt. Rarely, the word receipt functions as a verb. Could you please receipt my rent payment for this month? My boss instructed me to receipt the shipment even though a few items were missing. There aren’t very many phrases or idioms that use the word receipt. Be in receipt of: to have received (something). The first known use of the word receipt as a noun was in the 14th century, according to Merriam-Webster’s. Its first known use as a verb was in 1787. The word comes from Middle English from the Old French word receite, which comes from the medieval Latin word recepta, meaning received, or medical prescription, of recipere, to receive. The silent “-p” was added to imitate the Latin spelling. When looking for a word to replace receipt as the act of receiving something, the following synonyms may be used. Receipt is most commonly used as a noun to refer to the document received upon purchase of or payment for goods or services, or to the act of receiving something. Very rarely, receipt is used as a verb meaning to write a receipt or to mark as paid.